Navigating the tiny streets of Japan can be so cumbersome but then any small street would always be a pain to drive in no matter the country. But probably one of the toughest things to do when in a car is parking it especially in spaces where the fit is just too tight that you really can’t see where you’re going and estimating the distance from the wall or another vehicle is just so tough. But Panasonic has formed a solution for the dilemma by now selling a small camera that you can attach to the rear bumper of your car. 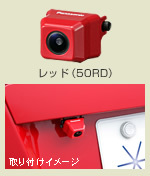 The camera is then attached to a small monitor that is installed on the car dashboard. With this setup, parking becomes idiot proof. The great thing is that Panasonic is also selling the product in different colors so it will match the color of your car. Isn’t it ingenious?